Experience the joy of creative expression with premium Faber-Castell art materials. This beautiful wood box gift set is designed to delight and inspire young artists. This premium quality set includes a 64-piece assortment of Faber-Castell drawing components. The set includes 24 Colored EcoPencils, 8 Watercolor EcoPencils, 2 Grip Graphite EcoPencils, 18 oil pastels, 12 washable Duo tip markers, a sharpener, paint brush, high quality artist paper and a 4-color illustration book in a wood gift box with velvet storage trays. 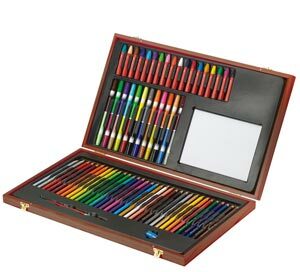 For the aspiring artist age six and up, the Young Artist Essentials Gift Set features a 64-piece assortment of premium quality Faber-Castell drawing components in a deluxe wood case. The set offers artist essentials for experimenting in various mediums, including 24 colored, eight watercolor, and two GRIP graphite EcoPencils. There are also 18 oil pastels, 12 washable duo-tip markers, pencil sharpener, paint brush, artist paper, and illustration booklet contained in molded, flocked storage trays. Non-toxic and safe for children, Faber-Castell pencils are made from reforested wood, preserving natural forests. 64 piece assortment of drawing components in a deluxe wood case. View larger. The Faber-Castell Young Artist Essentials Gift Set contains 64 premium drawing components forged of break-resistant leads that will not fall out. Use the sharp, distinct assortment of graphite EcoPencils for sketching, shading and stippling, or colored EcoPencils for blending and swirling colors together. There are also watercolor EcoPencils made with special pigments for producing beautiful watercolor paintings, oil pastels to create brightly colored works of art, and washable duo-tip markers ideal for lettering or cartooning. To help keep your drawing components sharp and ready to use, a pencil sharpener is conveniently included. There’s also a paint brush, 25 sheets of high quality artist paper, and an illustration booklet to get your young artist started. Delight and inspire young artists. All of the supplies can be used individually or together to create mixed-media art. When not in use, they can be stored in the deluxe wood case that features molded, flocked inlays for safe and snug storage. Faber-Castell art products are produced with environmental safety and awareness in mind. A hundred percent of the pencils are made from reforested wood, preserving natural forests. To this end, Faber-Castell forests are FSC-certified, ensuring that the wood used is obtained from renewable and sustainable sources, contributing to the preservation of the environment. In addition to being environmentally responsible, Faber-Castell art products are also nontoxic, making them safe for children to use. The Young Artist Essentials set offers an ideal way for aspiring young artists to graduate from crayons to more sophisticated mediums. Our testers noted the high quality of the drawing components, and were especially impressed by the vivid colors they produced. The inclusion of a paint brush, sharpener, and artist paper were also welcomed touches, making it easy to begin drawing right away. Wood carrying case, 24 colored EcoPencils, 8 watercolor EcoPencils, 2 GRIP graphite EcoPencils, 18 oil pastels, 12 washable duo-tip markers, pencil sharpener, paint brush, artist paper, and illustration booklet.